I have been asked if I would explain how it all came about. While I am under no obligation to do so, I recount the details that follow in the hope that it will put a stop to the unfounded accusations and blatant lies that I have recently been the subject of. I am an old man and my memory is not what it used to be. However, over the years I have kept journals to record my thoughts and observations. When I was a practising physician I kept especially detailed notes on all my cases, and this particular one was no exception. I had hoped that my journals would be used – either by myself or others – to untangle just a small part of the mystery of the human condition. Yet it seems that people these days are more interested in gossip than they are in science. It is my duty to set the record straight. It began in the winter of December 1898. At that stage in my career, it was not unusual for waifs to land on my doorstep at all hours of the evening. They had heard of my reputation and would find their way to my residence, bang on the door and then, typically, collapse in an unhappy heap, waiting for me to rescue them like some kind of knight in shining armour. Alas, I was only a doctor, not a miracle worker, and sometimes they died in childbirth, or the baby died, or both mother and baby died. It was an unfortunate state of affairs, but I sleep well at night knowing that I did the best that I possibly could, given the circumstances. My housekeeper, Miss English, was none too impressed with the reputation that I had gained for helping women in unfortunate circumstances. “Would you prefer that I leave them on the doorstep to die, Miss English?” I would say. And she would sniff three times, the way she did when she was especially affronted, and then, typically, neglect to bring me my morning pot of tea. So, I was not startled when I heard the banging on the door that blustery, December eve. I had fallen asleep at my desk. I recounted in my journal the dream I was having: there was a thick layer of snow on a forest floor, and I was following my father’s footsteps into the forest. There was a prism of sunlight breaking through the clouds – the kind that, as a child, made me think that God was close by. The knocking entered my consciousness gently. I woke up, rubbed by face and stumbled to the door. Miss English was standing at the top of the staircase with her lantern – as she did every time one of these unfortunates came to the door in the middle of the night. I can still see her there, her long, white night dress falling to the floor giving her the appearance of a footless ghost. “Right you are then Dr Beaglehole,” she said, lifting the hem of her night dress off the carpet and disappearing back down the hall. When I opened the door, there was a young man holding the arm of a heavily pregnant woman. The woman was barely conscious, her head falling forward on occasion and then jerking back up again. She wore a nightdress underneath a man’s woollen coat and men’s shoes without stockings, the laces undone. “Come, come,” I said, opening the door and helping the woman across the threshold. “First door on the right,” I said to the young man and his sister. As soon as I examined the woman, who I learnt from her brother George, was called Mary Gearie, I could see that I would be unable to deliver the baby. There was something not quite right about the pregnancy; although the cervix was fully dilated, I could not feel the baby’s head and there were strange protrusions on the outside of the woman’s belly that moved from one side to another like small, tight waves at the seashore. I had the feeling that I was about to witness something quite remarkable or, perhaps, quite monstrous. It was lucky that at that exact time, another doctor was staying in the guest room. Dr A. L. Peregrine was the friend of a friend of mine from medical school. A Northern man of few words, he was in London to attend a conference about his area of expertise – the Caesarean section. I called for Miss English, as Mary Gearie called out for her own mother, lost in some kind of delirium of hellish pain. It was more than 5 or 6 hours later that Dr Peregrine finally emerged from my examining room, wiping his hands on a blood soaked cloth. As I could not hear the sound of a crying baby, I assumed the worst. “None so bad, none so good,” he replied, wiping his brow with the bloody cloth. “The baby didn’t make it,” I said. “Oh, brilliant old man,” I said feeling a rush of admiration for Dr Peregrine’s quiet, modest manner. “Can I see them?” I said anxiously, having never lost the joy of holding a new born baby in my arms, cooing and babbling in a way that Miss English believed was unbecoming for a man of my stature. Dr Peregrine nodded and waved me into the room, with him following close behind. Mary Gearie lay on the examination table – fast asleep after her exhausting ordeal. George was asleep in the chair next to her, his hand still holding his sister’s. In a chair on the other side of Mary Gearie was a young woman wearing a man’s nightdress, and covered in a blanket, also fast asleep. “That is the little one,” he said, pointing to the young woman in the chair. “What?” I said, laughing softly, so as not to wake the sleeping patients. “What?” I said again, still confused. “Talk about what?” I said. “The birth of an adult,” he said calmly, reaching across to hold my arm. “Mary Gearie gave birth to an adult,” he said. I stared at him for a moment and, in my journal, I have noted that at the time I wondered if was still dreaming. “Good night Dr Beaglehole”, he said. “Or should I say good morning.” And with that, he walked out of the room. I distinctly remember looking at those three strangers asleep in my examining room, dumbfounded and shaking my head. I finished my journal entry for that day with a single line: Impossible. Absolutely impossible. The indignities of pregnancy. Meredith has to ask the taxi driver if he minds helping her up the ramp to the clinic. And then he stands by her side, holding her arm, as she waits for the receptionist to look up from her computer screen. “I’m fine, I’m fine,” she whispers to him. “Oh no”, he says. “A woman in your condition should be treated very carefully.” He smiles, his teeth brilliant white against dark skin. “My wife is also pregnant,” he pulls his wallet out of his pocket and flips it open. In the photograph pocket is a tiny ultrasound photograph. “Our little girl”, he says. The white, jelly-bean shaped shadow has her hands spread out in front of her face, one in front of the other, as if she is about to start playing an imaginary trumpet. “Oh, lovely”, Meredith says. She has her own ultrasounds in her backpack. She has folded them in half, probably contravening all the guidelines regarding the proper treatment of these strange, blurry, grey and white photographs. But she can no longer reach the shelves in her bedroom where she keeps her collection of bags so, at the last minute, she just shoved them into whatever bag was close to hand. She has pored over the ultrasounds multiple times, but they make little sense to her. She can see what looks like hands and feet, fingers and toes, but it could be anything. There are none that clearly show what the taxi driver’s photograph show – a perfect, recognisable, little baby. And she suspects that why she is here. She has been unable to sleep for days, dreading the news. There is something wrong. Certainly something wrong. She is only 5 months along and already she is huge. If it was a multiple birth, the sonographer would have just told her then and there, wouldn’t she? The taxi driver leads Meredith carefully to one of the seats close to the hallway and holds both her wrists as she bends down and slowly collapses back into the chair. He holds his palms up in protest. He strides back towards the door and waves before he exits. One wall of Mr Glover’s office is covered in Japanese style wallpaper – pink cherry blossoms raining petals down upon white cranes standing in silver ponds. There is a room divider on the other wall, in a similar Japanese style. “Does wonders for the digestion,” he says, picking up the phone. “Sure I can’t interest you?” he says, his hand over the receiver. “No, thank you,” Meredith says. He puts the phone back in the receiver and opens the file, flicking through the paperwork and nodding to himself. “Yes,” he says, “yes, yes”, licking his index finger and flicking through a few more pages. “And the ultrasounds?” he says. She hands him the folded envelope containing the ultrasounds. Her heart is beating hard against the front of her ribcage and her hands are sweating. Why can’t he just get on with it? “Yes,” he says, glancing quickly at the photographs, then looking up at her and folding his hands on the desk in front of him. Meredith breathes in and out loudly and holds onto the wooden armrests on the chair, as if she is preparing for some kind of wild carnival ride. “Beaglehole Syndrome,” he pulls a pencil out of his shirt pocket and flips over a piece of paper from her file. He has drawn a stick figure. He puts 2 dots inside the circle and a curved line beneath to make a tiny smile. “Beaglehole Syndrome,” he says, and stabs the stick figure’s face a couple of times with the tip of his pencil. “Beaglehole Syndrome,” he says, his hands folded together on top of the drawing, looking directly at her again. 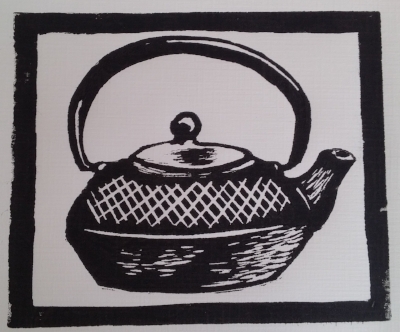 There is a knock on the door and the receptionist enters the room, carrying a teapot. Marjorie places the teapot on top of a pile of files on a bureau behind Mr Glover’s desk. “Thank you,” Mr Glover says again, as he holds one of the ultrasounds up to the light from the window. “But, that’s impossible,” Meredith says. She leans forward and pulls the file from underneath Mr Glover’s elbow. “Is this a joke?” she says, flicking through the file, trying to make sense of the test results and reports. “On the contrary,” Mr Glover says, as he swivels on his chair to fetch the teapot behind him. He swivels back quickly and places the pot and a small, blue handle-less mug on his desk. “This is a very serious condition”, he says, as he pours the tea from a height. “Back in your grandparents’ day,” Mr Glover raises the cup to his lips and blows on the tea, a soft, stream of mist drifting up to cloud his glasses, “a woman giving birth to a son or daughter with Beaglehole routinely died because of the risks involved. But you needn’t worry”, he says, putting down the mug and reaching for a notebook, “these days the risks are fairly minimal. As long as we keep a close eye on mother and baby.” He scribbles something in his notebook. “But this is ridiculous,” Meredith says. “How could a fully-grown adult possibly fit in there”, she looks down at her stomach. “The uterus,” Mr Glover says, “is a marvellous organ”, leaning back in his squeaky chair and bouncing a little, back and forth, like a little boy in his father’s chair. Meredith wonders for a moment if Mr Glover is an imposter. Some kind of mad man. That any moment now the real Mr Glover will walk in and apologise for this unfortunate incident. The intrusion of a nutcase who goes around posing as a doctor; doling out ridiculous diagnoses and trying to explain them away with glib references to the wonders of the human body. Mr Glover returns to his notebook and scribbles a few more notes. “I just can’t quite believe…,” Meredith says. “Yes, Dr Treadwell, as I say, it is a lot to take in. But, given time, the vast majority of parents of children with Beaglehole find a way to adapt. And can I reassure you, Dr Treadwell, that individuals with Beaglehole are perfectly average in every other way apart from the circumstances of their birth,” he leans towards his bookshelf and pulls down a framed photograph. He hands Meredith the frame. In it, a young, fair haired man wearing a poorly fitting suit stands between an older man and woman. The young man is slightly stooped, a reluctant smile on his face. The man by his side, with his hands in his pockets, is leaning in towards the young man, as if he has been told to bunch up. The woman has her arm wrapped around the young man, tightly clutching his shoulder. She takes it and stares at him, her mind a huge blank. “But I still can’t…,” Meredith says. I turn now to the events of January 1899. Over the course of that month, Mary Gearie and her daughter, who Mary had named Sarah, stayed with me to recuperate. Brother George would stop by every few days, bringing news of home. All three joined us for Christmas. When I enquired about Sarah’s father, Mary informed me that she was a widow. Her husband had died not three months before Sarah was born. George, it seemed, was Mary’s primary support. He was a devoted brother; bringing her small gifts and telling her stories that made her laugh. He was more wary around Sarah, but it was understandable. She was a quiet girl – difficult to read. A pretty girl, but at that stage I believed, not so bright. She seemed to be permanently in a world of her own. I hoped, though, that this was just the consequence of her extraordinary situation and that, given time, she would come out of her shell. Miss English took a strong dislike to the Gearies. In recent years, I have been accused of taking advantage of Mary and Sarah Gearie both. I have been questioned about my motives and I have had unscrupulous characters sniffing around my home, presenting themselves as one thing but, in reality, being another. I would like to assure you, dear reader, that nothing was further from the truth. I took these two women into my home and looked after them as if they were my own family. The case may not have gotten any attention at all if it had not been for the fact that, at that time, a good friend of mine, Dr M. E. Nettleworth, was teaching at London University. When I told him about the Gearie case, he asked me to bring them along to meet his students so they could learn more about this most mysterious and unusual condition. When I mentioned it to Mary she was unsure at first. She said she did not like the limelight. I was not especially surprised by her reluctance. Over the previous weeks I had learnt that Mary had lived a quiet life, growing up on her family’s small farm. The middle child in a brood of more than ten, I doubt her parents had a spare moment to pay her any special attention. She was an unassuming plain, sturdy type of girl; the type you might encounter in any small English village. Despite her trepidation, I told Mary that in my opinion she had a duty to share her plight with learned men. In the future, I told her, this would mean that other women in her predicament would not be subject to the kind of fanciful, ridiculous suspicions that had dogged them in the past. If nothing else, I said, do it for Sarah. Mary was not an unintelligent woman. She listened to what I had said and accepted the reason of my argument. She agreed that both she and Sarah would come with me to Dr Nettleworth’s class. The class went very well. I discussed the case with Dr Nettleworth’s students; some of whom asked Mary and Sarah questions directly. Men of that age often lack sensitivity and tact. However, I was pleasantly surprised at the respectful way the students treated both women and, I believe, both women greatly appreciated it. It wasn’t until after the class had ended, that I was approached by Mr Crockett Doob, an American man who was studying in London. Mr Doob’s father, Professor Benson Doob, was a world class physician who specialised in unusual medical conditions of the type that Sarah had been afflicted with. It just so happened that Professor Doob had founded a specialist hospital in Boston, Massachusetts where he invited patients with special cases to avail themselves of treatment, free of charge, in his world class institution. I told Mr Doob that Mary and Sarah would probably just as soon prefer to stay here in England, not being worldly types. Mr Doob informed me that he was certain his father would not expect Mary and Sarah to travel alone. And, that as their primary physician, I would travel with them to Boston and work with Professor Doob to investigate the cause and treatment for this most… delicate of conditions. And can I say, Dr Beaglehole, Mr Doob stated, that Boston is one of the most charming cities you will ever have the good fortune to lay your eyes upon. I’m sure you will not hold it against me for being tempted by Mr Doob’s offer. After all, at this stage in my career, having spent more than ten years tending to the needs of women in unfortunate circumstances, I felt I deserved a holiday. And, when I got to Massachusetts, I would be working with Professor Doob, most intensely I imagined, to investigate this most perplexing of conditions. This was an opportunity for Mary, Sarah and myself to contribute to science and thereby benefit future generations. Besides, when would two country girls ever get an opportunity to travel to another country and meet a man like Professor Benson Doob? As we walked back to the house, I informed Mary about the opportunity that Crockett Doob had described. Sarah was also walking with us, stopping to stare into cracks in the pavement, following the path of the blackbirds as they flew between trees in the park, picking up the leaves left over from autumn. Come, come Sarah, Mary would call to her if the girl fell too far behind. Of course, I presented this opportunity to Mary in a way that would not overwhelm her. I told her that should she agree to Mr Doob’s offer, we would travel abroad to meet his father – a man who was most interested in getting to know both her and her daughter. I said that this would be a good opportunity for her to recover from the trials that she had been through over the past few months. Just what the doctor ordered, I laughed. And then, most unexpectedly, she reached for my hand and rested her head on my shoulder. I could have let go of her hand right then and there. I could have gently moved away from her as she became more comfortable with this level of affection. But, dear reader, I am not as heartless as some have made me out to be. I put my arm around Mary’s shoulder and we walked like that together through London’s foggy streets. “Oh it’s not a condition that anyone wants to talk about. Until you have a child with Beaglehole, you wouldn’t even know it existed,” Margot Lovell says, tapping a teaspoon on the side of her cup and looking around on the table for a suitable place to put it. Her eyes have a faded milky sheen. Her hair is thick and grey, condensed in a tight plait that is curled on top of her head in a bun. Meredith is sitting outside a bayside café with her and her husband, Graham – the couple Mr Gloverhad encouraged her to contact. Graham squints into the sunlight through thick, square glasses. “That’s why we do it,” Graham says, nodding enthusiastically. Meredith has been putting off contacting the Lovells for weeks. She doesn’t want to think of herself, or her child, as someone with a ‘condition.’ A condition that requires ‘support.’ She doesn’t want to join a group of people who hover over their troubles and pick them apart until the problem becomes something else – a touchstone, a symbol of belonging. Margot reaches across and gently touches Meredith’s arm. “Is there something you’d like to talk about, or ask us perhaps?” she asks. “Did a runner did he?” Graham says. “We understand dear,” Margot says. “It wasn’t that I didn’t want to be a mother,” Meredith says. “You were excited!” Margot says and reaches out to hold Meredith’s hand. “Beaglehole,” Margot says softly, as if she is encouraging Meredith to say it herself. Graham nods, “If we can, you can”, he says. Meredith looks towards the beach. Two women walk briskly along the sand with a small dog, a man on a skateboard glides by, fat headphones over his ears, a crow and a seagull fight over the spoils of an overflowing bin. The air has the light, promising scent of summer, Christmas, holidays. But Meredith feels apart. As if she is a visitor. A tourist. An observer. Wishing she was here. “No, no, go ahead,” Meredith says. “Fifth of February 1968,” Graham pronounces it slowly, looks down at his hands. “Two days it was,” Graham nods, looking up again. “Everything they said,” Graham says. “But he told us later that they were doing all these tests you know? Asking him to button and unbutton his shirt. Walk backwards. Taking photographs of his body. Every single part of his body,” she turns away, her hand over her mouth. “Come on, come on,” Graham says, “chin up”, rubbing Margot’s back. “But things have changed now,” Margot says, wiping her nose with a handkerchief. “Not at all,” Graham says. “It’ll be much easier for you. You’ll be fine,” she says, reaching over and clutching Meredith’s forearm. Meredith smiles. “Where’s your son now?” she asks. “Oh he’s off living his own life,” Margot says. “Travelling around the country – finding himself,” she rolls her eyes and smiles, “as they call it.’ Graham stares at his hands, picking at a fingernail. “Isn’t he love?” Margot says, reaching for Graham’s hand. “Yes love,” he says, and it is his turn to look away and gaze out at the ocean. As she walks back to her car, Meredith passes by families enjoying a day out by the ocean. She stops halfway, out of breath and sits on a window ledge outside a café. Inside the café sits a woman holding a baby. The man who is with them fusses around; pulling things out from underneath the pram, wiping down the table. But the woman is caught up, in a world of her own – mesmerised by the tiny being she is holding. A little hand reaches up out of the bundle. Mother smiles. Baby gently touches mother's face. We set off for Boston in the spring of 1899 on a very fine ship called the RMS Grinter. It didn’t take us long to settle into the rhythms of ship-life. I found the sea air to be especially invigorating. During those few weeks I seemed to regain some of the energy I had enjoyed as a young man; up at dawn, a brisk walk around the ship to get my blood flowing, then back to the cabin to work on the notes I was compiling about Mary and Sarah for Professor Doob. During the day, Mary spent her days on the deck with a group of women she had befriended. They had plenty to keep them occupied – handicrafts, cards or, if weather permitted, a game of shuttlecock. If she saw me as I was taking my afternoon stroll, Mary would wave hello and I would wave back. These interactions were always followed by a bout of excited whispers among her and her friends. I suspect Mary had told them about our blossoming relationship and, as women do, they found cause to create drama around it. Sarah, on the other hand, was something of a loner. At first, Mary would encourage Sarah to join her and her friends on the ship’s deck. Mary told her friends that Sarah was her orphaned niece, and that having grown up in a small, isolated village with sickly grandparents she'd had little exposure to the outside world. This stopped them from asking why Sarah didn’t know a lot of the things a girl of her age should know – how to play charades, how to hold a shuttlecock bat, how to embroider a handkerchief. But after a time, it became clear that Sarah did not socialise well. She stared at people when they talked to her and often didn’t reply. If she did speak, it was often out of turn, blurting out strange statements that had nothing to do with the topic at hand. She peered at inanimate things as if she was a scientist in a laboratory; kneeling on the deck and bending down to examine at the cracks between the floorboards, for example, or stooping to inspect the knob on the cabin door. We had to remind ourselves that Sarah was like a child – she had never seen these everyday things before, and she approached them as a child would – fascinated, perplexed. But, of course, she did not appear as a child to others, so they labelled her as odd, or slow. I urged Mary to let Sarah go her own way, so she stopped encouraging Sarah to join her and her friends on the deck. I assured Mary that I would keep a look out for Sarah, to ensure she didn’t put herself in any danger and I also asked some of the crew to keep their eye out for her around the ship. On a more than a few occasions I took it upon myself to observe Sarah as she walked around the ship. I felt it would be useful for Professor Doob to learn about Sarah’s habits and behaviour. During these observations, I carried my notebook with me and observed her at a respectful distance, in the same way a naturalist might observe a reclusive animal. In fact, it was a mystery to me how Sarah could speak at all. How did she know the words for anything when she had not had the time to learn the complexities of language? How did she know how to walk, for that matter? How to focus her untrained eye on objects? How to sit in a chair? How to hold a knife and fork? As a child my mother had always told me to leave some mysteries for God. We don’t need an answer for everything Harvey, she used to say. But I was a doctor. And I had only gotten to that position in life by finding answers. That is what people came to me for – for the answers to their questions. Why was their chest so sore? What was this raised, red rash on their back? Why was their child walking with a limp? Why did their baby have a fever? Was their son / daughter / mother / father going to die? I could hear my mother’s voice in my head, You’ll send me to the grave with all your questions Harvey Burgess Beaglehole! Just go out there and play like all the other boys do, for pity’s sake. Luckily, my mother’s reprimands never deterred me as a child. And, as a grown man, I knew that I could not afford to leave all these mysteries for God. Professor Doob and I had a duty to unravel this condition. Not just for Sarah and her mother, but for all the unfortunate people who are afflicted with it – both now, and in the years to come. Over the course of those first few weeks on the ship, my observations of Sarah continued unheeded. I assumed she had no idea I was following her – she never turned around and acknowledged my presence. She acted as she always did; as if she was in a world of her own. However, one morning, as I followed Sarah on her well-worn route – down the staircase to the second-class smoking room through the third-class kitchen, past the third-class berths – she led me right down into the engine room. It was dark down there, and having poor sight – even in the light of day – I could barely see anything; just vague shapes and shadows. I listened, hoping that I could follow Sarah by sound, but I could hear nothing other than what I assumed to be the whirring of the fans that fed the ship’s boilers. At first, I was annoyed; annoyed that Sarah had bought me down to this place where I could hardly see, and my senses were overcome by the smell of burning coal. But how could I be angry with her, when she didn’t even know I was there? Then I became annoyed with myself, for not taking more notice of my surroundings. That I had been so focused on Sarah, that I didn’t even look at where I was going. I cursed myself for being so curious. That wretched part of me that my mother always tried to temper. I felt the breath going in and out of my body but it was as if the oxygen was not rich enough. I breathed deeper but my head felt light and the muscles in my legs seemed to be contracting when they should have been expanding, expanding when they should have been contracting. I had to get out of there. I could not stop. All I could think of now was reaching the deck and the sunlight. We carry a piece of our childhood selves as adults – that’s what I had always believed. Somewhere in our mind or our body, or perhaps even our soul, are the vestiges of that vivid imagination, that sense of wonder with the world, that capacity for pure joy, pure fear. As a child I was afraid of the dark. And the fear has never left me. In my panic, I lost all the vestiges of logic and reason. I was walking into what felt like big steel walls, falling into sharp edged, water filled pits, falling over pipes that groaned like dying old men. I stepped over something but misjudged the size of it, slipped on its cold edge and fell backwards, hitting my head on something. I heard my skull bouncing off metal, ringing in my ears and echoing off the walls of the dark place where I was trapped. “Help!” I called feebly. Only a few seconds passed, then I heard her soft footsteps. When I reached out, I felt her bare leg. “Oh Sarah,” I said. “Thank God.” She knelt beside me, and placed her hand on my shoulder. I went to stand up but she stopped me. “Just a moment,” she whispered, and her hand swept swiftly from my shoulder to my chest. Her cold fingers crept into my shirt and onto my bare skin. She placed her hand over my mouth. “Shhhhhhh,” she said. Of course, I am not proud of the events that occurred in the bowels of that ship. And you may ask why I was not more forceful with Sarah; ordering her to stop. All I can say is that I was momentarily overcome – possibly because of the blow to my head, and the after-effects of the sheer panic I had felt in the moments just prior. At that moment, my childhood fear of the dark completely dissipated. I wouldn’t have known if I was in the dark or under a bright, shining light. On a ship or on a magic carpet. In the middle of the Atlantic Ocean or in an igloo in the North Pole. I was somewhere else entirely. I felt myself as both a body and the whole world. “Sarah,” I whispered. Then she took my hand and led me up to the light. On the second last night of our voyage, Mary and I stood on the deck of the ship, watching seabirds glide along the windbreak. I was watching a gull, as it dipped into the churning water caused by the ship’s bow as it cut through the water. From the corner of my eye I saw Mary’s hand, holding a small package, and passing it to me. I opened it. It was a set of handkerchiefs, made of fine cotton, embroidered with my initials, H. B. B. For you,” she whispered, “dear Harvey,” reaching up to stroke my cheek with her hand. I couldn’t even look at her. I focused on the gull as it rose up from the water, and drifted away into the endless night. Meredith wakes up on the ward. A man is leaning over her, pulling up the rails on the side of her bed. He has a cotton shower cap on his head. It takes her a while to place him; it's the orderly who wheeled her into the operating theatre that morning. “The child?” she says to the man, reaching out, trying to grab hold of his arm. Her vision is blurry. Her muscles weak. Something aches in her belly. “Where’s the child?” she says. “You’ve just had a big operation,” he says, “just lie back. Try to rest.” He smiles down at her, pats her hair for a moment. She closes her eyes. “The child” Meredith whispers again. But when she opens her eyes, the orderly is gone and through the window she sees the pastel coloured clouds of dusk. A woman throws a tray covered with food onto the trolley beside Meredith’s bed. “Where’s my child?” Meredith says to the woman. The woman looks at her and shrugs. “Where is…” But the woman walks away and she is alone again. The pain accompanies Meredith in her dreams – becoming other things. The tight, cotton band of a dress and when she unravels it she finds a row of razors sewn into the inside. And in one dream, the pain is a small boy. His legs are wrapped around her waist. She struggles to pull him off. His legs are like hot stones, searing at her flesh. But the more she tries to get him to let go, the tighter his hold becomes. “A strapping young lad Dr Treadwell. No doubts whatsoever about that. Quite handsome too. Good genes I dare say,” he lets go of Meredith’s arm and smiles. “I’d like to see him.” She starts to cry, thinking about the story Margot and Graham Lovell told her. Experiments, observations. She wants him here with her. “No, no, I’m okay,” Meredith says. His voice is thick and slow, slow, slower. She is finding it difficult to follow him, feels dizzy, overwhelmed. “Can I see him?” she says quietly, before she drifts back into sleep. That night, the orderly takes Meredith down to the ward. It is strange, being wheeled past all these men; wondering which one is her son. Does he look like her? Will she know immediately which one he is? Will he know who she is? The butterflies in her stomach are masking the pain from the surgery. She wants to grab the wheels of the chair herself and push it faster – race through the wards until she finds him. They arrive at the entrance to a darkened ward. All the beds are empty, except for one. The curtain is drawn. The orderly wheels her into the ward and pushes her through the curtain. And there he is. Her son. Her sleeping son. She reaches out to touch his light, golden, curly hair. She leans in to look at him, smiles. “Hello my boy,” she whispers. There is something familiar about his face and she cannot stop staring at it. The soft velvety down on his chin. His pearl-smooth; no wrinkles, no sun spots, freckles, scars, blemishes. She understands now why people describe birth as a miracle. How is it possible to have a love so deep for someone you don’t even know? Immediate, pulsing, electric, spine-tingling love. “Perfect,” Meredith says. “He’s perfect,” to no-one in particular. We arrived in Boston, Massachusetts by train in May of 1899. On the afternoon of our arrival at the Doob Memorial Hospital, I was lucky enough to meet with Professor Doob in his office. I was expecting a large man, an imposing man, as large and imposing as the impressive bluestone hospital he had founded. I was surprised to find, however, that Professor Doob was short; so short, I found myself having to bend down to shake his hand, as if I was communing with an elf. He had a thin face with bright, eager eyes and a marvellous silver moustache that was carefully curled at its tips. “Ah, Dr Beaglehole. So happy you could join us here at the Doob Memorial.” The Professor’s voice was booming, as if to make up for his diminutive stature. “Yes, yes,” he said, slapping me on the back and almost winding me. For a small man, he had surprising strength. “Come in, come in,” and he ushered me towards a chaise lounge that faced the window. “Whiskey?” he said, walking to the corner of the room and pouring a glass for himself. “Most kind,” I replied. From the window I could see the hospital’s extensive grounds. It was a pleasant garden, with silver Birch trees among a few old oaks. Some patients strolled about – most walked alone, a few walked in couples. All the patients wore white. They reminded me of the angels my mother used to describe to me when I was a child. He nodded and reached into his jacket pocket. “Cigar?” he said. My weak lungs mean that I have never been able to abide smoking. Yet I felt it would be rude to turn him down. "Thank you," I said, placing the cigar in my pocket. “I have them shipped in from Havana,” he smiled, holding up his cigar, “I think you will appreciate the quality”, he tapped the cigar, three times, on his knee, clipped off the end, sat back and lit it. “Not like most women you say?” the Professor said, blowing a mouthful of smoke up towards the ceiling. “Well that can only be a good thing, wouldn’t you say Beaglehole?” He smiled and punched my arm playfully. “Yes, yes,” he said, standing up. “Let us begin with our observations, shall we?” He pulled the lapels of his coat down briskly, and tapped his cigar into an ashtray that resembled the open palm of a giant ape. “What a remarkable ashtray,” I said. “Mountain gorilla,” the Professor said. “Shot it when I went on safari in Africa. Magnificent animal,” he said, looking down at it and pausing for a moment, as if paying silent vigil to the life of the creature that had once called this ashtray his hand. “Yes, yes,” the Professor said, as if answering his own question. I followed the cloud of smoke that trailed behind him as he walked out the door. The patients did not appear especially ill. Some were clearly suffering from nervous conditions; hovering around the doorways and wringing their hands, their faces permanently creased with worry. They trailed behind Professor Doob, tugging at his white coat, whispering, calling, shouting his name, until the orderly – a huge, bald man with arms as wide as tree trunks – intercepted and gently picked the patients off the Professor. The Professor took all this in stride; barely registering the presence of the dozen or so people crowded behind him. “Ah, Jackson,” the Professor called to the orderly as he led the patients away. “This is Doctor Beaglehole. Come all the way from England to see us!” The orderly nodded, his giant arms blocking the patients from getting to the Professor. He turned and redirected the patients away from the Professor. “The Professor is busy now,” he said, “come on, move along.” They slinked off like stray dogs. As we entered each ward, the Professor would ask ‘What have we here then?’, subsequently asking a patient to hold up a six-fingered hand or lift their top to reveal a withered pair of tiny legs growing out of their stomach. One woman wore a veil over her face. When the Professor asked her to lift it up, I had to stop myself from recoiling in horror – her face was covered in thick, coarse black and white hair, like a badger. Some of the patients did not appear to have any physical deformities. There was an old lady who sat on the edge of her bed, clutching a corner of her bunched-up sheet, silently lifting her shirt, opening her mouth, turning her head when Professor Doob asked. Another patient, a young man, kept asking Professor Doob when he could go home. “What’s wrong with him Professor?” I whispered, as he placed his stethoscope upon the young man’s back. “How much longer Professor?” the young man asked, his voice wavering now, reaching out and grabbing the Professor’s sleeve. The Professor looked at him for a moment, from one side and then the other, in the same way a man might look at a piece of furniture, wondering if it will suit the dimensions of his house. “Yes, yes,” the Professor nodded, carefully prising the man’s fingers off his jacket, and briskly walking towards the door. “How much longer?” The young man’s voice was clearly audible from the other end of the hall. “And what have we here then?” the Professor announced as he entered Mary and Sarah’s ward. Mary stood up and offered the Professor her hand. “How do you do Sir,” she said. “Yes, yes,” Professor Doob, looking down at her hand but not shaking it. “This is the one?” Professor Doob looked at me. “No, no,” I said, “this is Mary, Sarah’s mother. That’s Sarah there.” I pointed at Sarah. She was standing by the window, making shapes with her hands in the sunlight that streamed into the room. Mary smiled at me as Professor Doob approached Sarah from behind. I reached out and quickly squeezed her hand, smiling back. “So,” Professor Doob stood beside Sarah, the top of his head reaching her shoulder. “I see,” he walked around to the other side, all the while muttering, “yes, yes, yes, I see, yes.” Sarah ignored him. She was mesmerised by her hands; as if she had just discovered them. The Professor looked at Mary, looked at me, looked back at Mary and back at me. It was as if he couldn’t quite believe that Mary could talk. “Yes, yes,” he said, nodding vigorously. He turned on his heels and exited the room. “I’ll come and see you tomorrow,” I whispered to Mary. “Not tonight?” she said, grasping my hand. “Sorry dear,” I said. “The Professor and I have a lot of work to do.” I gave her a quick peck on the cheek and walked back out to the hallway where the Professor was, once again, swamped by pleading patients. The next day I went to see Mary as I had promised. Sarah was at the window again – this time with her palms pressed flat against the glass, whispering to herself. Mary was sitting on the bed, knitting. When she saw me she smiled, but I could see she was not herself. I sat down next to her and patted her knee. “How did you sleep last night dear?” I asked. She sighed. “Not so well I’m afraid. The noises here are horrid – groaning and screaming – and they go on all night.” Mary reached for my hand and pulled it towards her, clenching it in her lap. “I have a strange feeling about this place Harvey,” she said. “I know dear,” I said, trying to comfort her. Sarah turned around just then and glared at me. “Sarah, don’t stare dear. It’s rude,” I said, unwillingly recalling the dream-like encounters I had had with her in the bowels of the RMS Grinter. Wishing they had been dreams, for Mary’s sake. Sarah’s mental and physical state demised gradually over the next few weeks. On a number of occasions, she tried to attack me in the hospital corridors. It was only with the orderly’s help that I was able to prise her off my back, and stop her from pulling at the skin of my face. It was as if she was trying to rip the flesh right off the bone. “Cheat! Cheat! Liar!” she would shout, as the orderly carried her back to her room. It was pointless trying to calm her down. It became easier for all involved for me to withdraw from Sarah. If I saw her in the corridors, I would not pander to her neuroses, as I once had. I treated her in the same professional manner I would have any other patient. Although it was difficult for me to do so – I had always been fond of her – I knew it was for the best. It was surprising that Mary also suffered a demise during that period. I had no idea that the condition could impact upon the mother of the child in quite such as a drastic way. Mary became obsessed with the idea of returning to England. She got it into her head that she would never go home, that there was some kind of conspiracy to keep her in the grounds of the hospital. On Professor Doob’s instructions, I saw Mary less and less. He had noticed that Mary became especially despondent after my visits. I followed his sage advice, however difficult it may have been. I tried to recall the happy times Mary and I had spent together over the previous months and hoped that eventually she too would find comfort in those memories. I did not want to leave Boston when I did. I had been there for months, however, and was worried about my practice back in London. Although Professor Doob and I had made some progress, there was clearly much more to learn about the elusive condition. I reluctantly agreed to leave America without Mary and Sarah in order that the Professor could continue to undertake his research. As I was preparing to leave, Professor Doob suggested that I leave with the minimum of fuss and not say goodbye to Mary and Sarah. As I walked away from the hospital for the last time, I looked up at their window. Sarah was standing there again, palms pressed against the glass. She stared down at me with those strange, translucent eyes. It was only a few months later that I received a letter from Professor Doob informing me that the syndrome Sarah was born with was to be known, from hereon in, as ‘Beaglehole Syndrome’, in recognition of the role I had played in bringing it to the world’s attention. Enclosed in the letter was a copy of the official minutes of the American Physicians’ Association, listing the inclusion of the syndrome in their official Diagnostic Manual. I still have the copy of the minutes, framed on my office wall. “Have you thought about a name?” Meredith is sitting beside her son’s bedside as the picks up each of the items on the tray of food sitting in front of him. “That’s this?” He holds up the jug of milk. “That’s right! Good! You’re learning so fast.” She leans as far forward as she can and awkwardly pats his shoulder. She is still in a wheelchair, but the wounds from the Caesarean are healing and the pain is gradually subsiding. He pours the cornflakes into a mug. “No, no,” she laughs and points to the bowl. “You have them in a bowl. You have your drink in a cup.” He shrugs and raises his eyebrows as if to say, How would I know? It surprises her that his mannerisms are already formed. She was him expecting him to be less self-assured. Everything he knows how to do surprises her: that he knows how to speak, how to sit up, how to clench his fists, how to walk (albeit a little shaky on his feet). “The brain is a highly adaptive instrument,” Mr Glover had said when she asked him how it was possible for her son to know so much already – even though he had only been born a week ago. “In any case, better that he knows more rather than less. It will certainly make your job a lot easier,” he laughed. “Wouldn’t you say Dr Treadwell?” And then Glover was off again, sweeping aside his fringe as he rushed to his next consultation. Her son raises the spoon and leans towards it slowly – so mouth meets spoon rather than spoon meeting mouth. She is careful not to pick at everything he does, not wanting to destroy his confidence. “Good?” she says as he chews. He nods. “So. A name?” He shrugs again. “Isn’t that your job?” he says, mouth wide open, spitting shards of cornflake all over his bed. “This?” He lifts up a banana from the tray. “Tell us what Meredith? It doesn’t matter, does it? He’s a perfectly healthy young man and he’s your son. Perhaps you could contact the social work department, here at the hospital. They have some very good counsellors here, so I’m led to believe. I’m sure they can help. Now if you’ll excuse me, I really must continue with…” But Meredith had already wheeled herself back into the ward, before he’d even finished his sentence. “Peel it,” Meredith says to her son. “From the top, like this,” she mimics the action of peeling a banana. He turns the banana around and around in his hands, not quite understanding the actions her hands are making. Three days later, Meredith and her son are in the social worker’s office. The social worker is rifling through a pile of notes. Meredith’s son is looking at a magazine. He stares at the photos as if they are a puzzle; holding them sideways, upside down, close to his face, and then at a distance. “Sorry, what was the name again?” The social worker looks up, smiling, her face vacant. Meredith’s son is looking at an article about Arnold Schwarzenegger. “Who’s this?’ he asks. “First name?” the social worker says, looking at the cover of one of her files. “What does he do?” Meredith’s son asks, pointing to the photo in the magazine. “And how are you both?” the social workers says. “Arnold,” her son says, pointing again to the photo in the magazine. “Yes, that’s Arnold Schwarzenegger,” Meredith says. “Lovely,” the social worker says. “I think that’s a lovely name.” Arnold Treadwell flexes the muscles in his bicep, copying the image in the magazine. I turn now to more recent events. A woman presented at my front door three weeks ago exactly. Every now and then this will happen. A woman will turn up hoping I can help them, perhaps having heard on the grapevine that this was a place where young women in trouble were treated with kindness and dignity. I assumed that was what this woman wanted – perhaps asking for help for a sister, a daughter, a friend. At the time I had no idea of her relationship to the Gearies and she, most deliberately I suspect, did not happen to mention that when we first met on the doorstep. She merely asked if she could speak with me. If I was a less hospitable man perhaps I would have left her at the doorstep and not invited her in. Perhaps I could have told her I am an old man and I cannot help her. That I am tired and wish only for peace in these final years of my life. I wish I had – but instead, I let her in and led her to the dining room. Unfortunately, I am no longer able to entertain in the way I once did. Miss English passed away two years ago now and since then the house has not received the kind of attention she so conscientiously bestowed upon it. I could only offer the lady a cup of tea, a small, stale shortbread biscuit and a seat on a rather tired looking armchair. I was unaware that Miss English’s cat – Trixie – had given birth to another brood of boisterous, black and white kittens underneath the very same armchair where this woman sat. As she sipped on her tea, one kitten after another jumped out and attacked her shoes. “How can I help you dear?” I asked, smiling at the little creatures that gathered around her feet. She reached into her bag and pulled out a pile of unkempt notes and papers and a pen. Then she peered at me over the bridge of her spectacles. She was a dowdy woman, hair like a bird’s nest, unkempt and wild. It was the look in Miss Gearie’s eyes that unnerved me. She had her pen poised over her paper in the same way one might hold a knife prior to plunging into someone’s back. I took a moment to compose myself. “My family,” she said, looking down at her notes, a slight acidic tone to her voice. “Yes,” she said, “quite. Before my father died, he passed on some documents to me. This is a record of arrest.” She held up the document as evidence. “My aunt, Mary Gearie spent…” she rifled through her notes again, pulled out another document and looked at it closely, “twenty-seven years in the Memorial Hospital before succumbing to an unknown illness.” She looked up at me and paused, awaiting my response. “I had no idea,” I said, feeling as if a plug had been pulled from somewhere in my body – a strange feeling of emptiness and heaviness all at once. I looked down and saw a kitten attacking the laces of my shoe, its sweet face contradicting the ferociousness it displayed, jumping on my shoe, pulling at the lace and gnawing at it, the way a lion might pull at the flesh of its prey. I would only have to raise my boot and press my heel upon this kitten’s neck for a few moments and it would be dead; that is what I was thinking as I looked down upon it. But the little creature trusted not so much in my benevolence, but in its own right to exist, to continue, to grow, to become. And that, perhaps, is also our greatest weakness, the weakness of mankind; we fail to see the giant boot above us. Her voice seemed to be travelling towards me in a tunnel, from far away. I had almost forgotten she was in the room. “Your aunt would have been very proud,” I said. She glared at me with that same fierce, determined expression. “I’m sure she would have,” Miss Gearie said. “If she had ever had the chance to know me, and I her.” She collected her notes, flicked a kitten off her shoe, and left, without the basic courtesy of thank you or goodbye. Over the next few days, I did my best to read the newspapers in the same way I always do. I pretended I was not looking out for this article Jean Gearie had threatened to write. In truth though, every time I turned a page my stomach momentarily jumped up into my chest and I scanned the page, looking for any reference to the Gearies. I can’t tell you why I was afraid of her and her accusations. After all, I had done nothing wrong. I did my best to help Mary and Sarah. In fact, I had gone out of my way to ensure they got the best possible care. If there were some indiscretions on my part along the way, I put them down to the perfectly natural – albeit inconvenient – urges of young adulthood. Besides, I cannot be blamed entirely for those indiscretions. It takes two to tango, as they say in Buenos Aires. I never married, or had children. I devoted myself to my career – to the pursuit of knowledge, to furthering the interests of mankind through science. On those occasions when I thought of Mary and Sarah, I pictured them back on their farm, living out their lives amongst their family. Roughly a fortnight ago – early in the morning – I heard another knock at my door. Unusually for me, I had slept in. I put on my glasses and shuffled to the door, sweeping away Trixie’s mewing mass of kittens as they gathered at my feet. “The Case of the Abandoned Women. The article in the Manchester Guardian? Just today. Have you not seen it?” He held up the newspaper and I saw the headline. The by line was ‘The Professor’s Disgrace.’ There was an accompanying photo of Mary, Sarah and myself – all those years ago, on the deck of the RMS Grinter. “Perhaps you’d like to explain how this all came about?” Mr Spring said. I slammed the door in his face and I have not left the house since. Other people have come knocking on my door. Shoving notes and letters through the mailbox. One person was even throwing pebbles at my window. “Professor Beaglehole? Professor Beaglehole!” they shout, all hours of the day and night. I cannot leave the house. I am trapped. Needless to say, I have run out of food. Dear reader. It is the 13th of December 1949, and I am starting to get quite hungry. After almost twelve months, Arnold Treadwell is preparing to leave home. At least, that’s what it feels like to his mother. He is travelling north to go fruit picking with his girlfriend. Meredith has given Arnold her old backpack. The last time she used it she too had been escaping from the clutches of her family and their stale rituals. “Annabelle said that if we wait too long, we’ll miss out on the best jobs,” he says, winding multiple cords for phone, iPod and laptop around his hand. Annabelle, Arnold’s girlfriend, is sitting in her van outside – the one they plan to drive to Queensland. “Twelve months is enough.” He has become more abrupt since he met Annabelle – more confident. More like a young Australian man, less like a foreigner from some backward, distant country. A strange phrase, she thinks; when you had me, when I had you. As if it is only in that very brief period of time of giving birth that we have our children and, after that, they are gone. No longer ours. But whose are they? She is not ready to hand him over. Not just yet. “I’m not going forever,” he says, holding the straps of the backpack and pulling it up, readjusting it, trying to get comfortable. “I guess so,” he says. “We’ll see how we go.” He starts walking towards the front door. She has a sudden, strong urge to reach out for him, hold him back. He opens the front door and turns back to face her. “Okay,” he says. “I’ll try.” He closes the front door quietly. Meredith goes to the window to watch him leave. Her son strides like a king towards the passenger door, falls into the seat, one last wave and then he looks backwards towards the road. He looks like any other young man out there; confident in his eternal potential, his endless promise.